Levente Szabo. 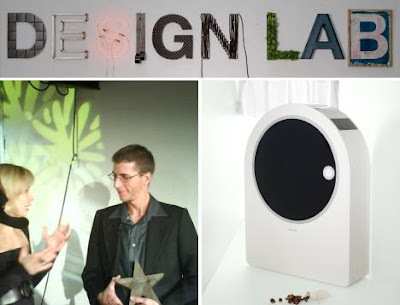 Congratulations to the Hungarian design student, who took home the top prize from the Electrolux Design lab 2007 competition with E-wash, a compact washing washing machine that uses soap nuts instead of detergent. The announcement came yesterday in Paris, where all the finalists had gathered to compare and celebrate their designs. The fifth edition of the contest featured the second clothes washer in three years (remember the Airwash?) to garner the win; it's most notable feature is that it's designed to use soap nuts rather than detergent, to make it viable for use in developing countries across the world. It came from the challenge to students to come up with environmentally-sound, commercially viable products and solutions that would enable consumers to "live in greater harmony with the environment." Szabó says that his starting point was the polluting effect of both the washing process and the production, packaging and transportation of the detergent. “I was looking for a substance that could replace the detergent,” he explains.“ The soapnut is a natural plant and can be cultivated. It does not harm nature but is a part of it.